I love it when a new business comes along and disrupts and/or supplements the incumbents. When Netflix showed up on the scene and kicked Blockbuster to the curb, I was impressed by their valuable new spin on an old business model. Recently, though, I've been hearing about a new company called Pley, which is frequently being called the Netflix of Legos. Pley's model is similar to the DVD rent-by-mail service invented by Netflix, except they are doing it with Lego toys. For a reasonable monthly rental fee, a customer can have a designated number of Lego playsets in their possession at any given time (quantity dependent on subscription plan). When a set is returned to Pley, the next set on the list is shipped out to the subscriber. I think I would have loved this as a kid. Having said that, I also would have loved eating ice cream for dinner every night. Looking back from an adult perspective, I am grateful my parents had me eat balanced, healthy meals instead of ice cream, and I'm very grateful this Lego rental service didn't exist. Now is the time in this post when I must confess to you I don't have kids. If you want a review of Pley's offering, there are better sites then this one to use as a resource. You might try this review, or this one, or even this one. Instead, I'm coming from the perspective of an adult, who without knowing it at the time, derived a lot of benefit from a childhood spent alongside my giant Lego bag. Growing up in a time without computers or cell phones, playing with Legos was the prominant way I spent idol indoor time. I typically asked for Lego sets for Birthdays and Christmas (this is when I usually got the bigger sets like the space stations, space ships, castles, and semi-trucks), and I was sometimes just the lucky benefactor of a set for no particular reason (these were usually the small sets like a moon rover or a race car). I'd get excited, tear open the box, follow the instructions step-by-step, and then spend the next day or two playing with and showing off my awesome creation. There is no doubt I would have excitedly done this every time a Pley Lego shipment showed up in the mail. But I expect that this is where the value of the Pley service ends. In the Pley model, when you're done building and playing, you put the pieces back in the mail and wait for the next set to arrive. Contrarily, in my youth, I deconstructed the model and deposited the pieces into the giant Lego bag (a bag I believe my Mom constructed by putting metal eyelets around the perimeter of a large circular sheet of denim and running twine through it to act as a draw string). Thus, the Legos were returned to my own personal "warehouse" to be used as raw materials for my next creation. Only the next creation was not like the ones that came before it. The next creation did not come with instructions and it was not limited to the pieces that came in a single set. The next creations were born from my own mind. They were ideas I had and wanted to try to build or they were things I saw in the real world or on television that I wanted to mimic. Sometimes I started off just putting pieces together and then, hours later, I'd have an object sitting in front of me that didn't exist in my mind or in the real world until that very moment. As more sets were added to the bag, the number of ways to architect things grew exponentially. I remember making the space battleship from Starblazers countless times and I never made it the same way twice. Early versions were a patchwork of colors with clunky features and an indent to serve as the ship's "wave motion gun." Later versions boasted a steel gray top side and a deep red underside, with smooth curves and rotating gun turrets that could aim up and down. In the time when I was fond of the television mini-series "V", I molded clay around the yellow Lego people heads and sculpted them into little lizard faces. If I wanted things in the real world I couldn't afford, I made them out of Legos. 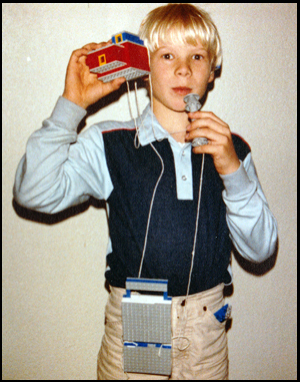 When I wanted to be a news reporter, I built a Lego camera, microphone and tape recorder (no, they didn't actually work). When I started to earn an allowance, I built a Lego money vault (it had a working door and locking mechanism, but suffered the key security flaw of being easily deconstructed). Let's be clear, I'm not an architectural or creative genius. None of my Lego creations were brilliant works of art (as evidenced by the included photo). I was just a kid who liked playing with Legos. However, Legos helped me learn aspects of creativity and engineering. They taught me to look at things differently, to take things that started in my mind and make them real, and to attempt to build things I saw else ware. My Legos contributed to building mind muscles I've been using ever since. Don't get me wrong, building the model that comes in the set by following the included guide had value too. The process contributed to my ability to follow instructions and taught me that missing or skipping steps will fundamentally impact the final product (a lesson I'm still learning from Ikea). A growing body of research suggests this type of structured learning is very beneficial to early child development. But by the time I hung up my Lego bag for the last time, I had close to a decade's worth of Legos collected inside of it - comprised of dozens of unique sets. To this day, I can remember many of the creations I conjured up using my hodgepodge of intermixed Lego sets, but I can remember very, very few of the actual models I built by following the included instructions. If there is value in the work Pley is doing, it's in the PleyWorld marketplace they are creating. My recommendation for them would be to dump the "Legos for Rent" concept and focus their efforts here instead. Admittedly, there is already competition in this space from others who focus on MOCs (short for "My Own Creation"), but I suspect there is a lot of room for improving and perfecting this niche and Pley has great momentum. I'd like to see them continue to grow the community and create tools that help people share their creativity with others. Enable others to build, modify and improve on those creations by making it very easy and interactive. Reduce the friction for sharing models and instructions (tools like this one are a great start, but this type of capability could be a web experience, integrated into Pley World). Above all, dump the rental model in exchange for selling the sets outright. Buying, not renting, is how kids will continue to grow their Lego stash, and by extension, grow their minds. Pley has the opportunity to become the community and the marketplace for inspiration and creativity, even if they have to build it brick by brick and without any instructions to guide them.